So, hey. Howdy. Hi. I thought I’d check in and let folks know I’m still alive. I was prompted to write after I saw a Twitter notification email about #dblogcheck day and thought, “hey! What a great way to get back into blogging.” Turns out it was two four days ago. Oh. Oops. I learned that my pump can give a maximum bolus of 25 units the other day. I may have to get creative in the next few weeks as I gave myself 24 units to cover my meager breakfast this morning. (And was still 141 one hour after the meal…) I half cried, half laughed when my MFM changed my breakfast carb ratio to 1:1.5. She told me some of her other T1s were on 1:0.5. In the back of my mind, I know I’ll get to that point, but I didn’t think it would be this early. Or that I’d be lucky and it wouldn’t happen to me. For the time being, I dial in my carb count and blindly hit “Act” twice to start the bolus without looking at the final number. I think I’d just freak out. I feel like the 3rd trimester is when things can start to fall apart or go really well for me. Currently, my MFM is dead set on letting me carry to term and beyond pending nothing else is medically wrong. It’s a little different than conventional wisdom which basically states that if you have diabetes, you are getting induced any time between 37-39 weeks just because. I would love to be able to avoid to pitocin drip and I’m glad my MFM supports that. However, the little worries in the back of my mind still plague me. The idea that pre-eclampsia can knock me off my feet and out of the game is almost as scary as childbirth itself. Mostly because it’s something that just happens… with no warning signs or ways to prevent it or avoid it. Being the control freak that I am, I don’t know if I could handle it. And bed rest would bore me to tears. Tomorrow, the hubs and I start interviewing doulas. We’re headed to a local event where you can meet a number of them at once and find out if any of them click with your birth plan. Our challenge is finding one who will help me through the first stages of labor naturally, but won’t try to push his/her ideals on us (or my doctors!) if we need medical interventions or when I call for my epidural. And as a high risk patient, I’m all about getting this kid out safely and sanely… even if it means throwing my ideal birth plan out the window at the last minute. If that person happens to exist, I’ll hire him/her on the spot. Am I having a “normal pregnancy” otherwise? I guess; besides the litany of doctor appointments, blood sugar readings, screenings, and limited real estate remaining on my abdomen for infusion sites, of course. I hate maternity clothes and how expensive they are and if I could live in flip flops and yoga pants, I would. (WHY do the cheap maternity pants not have pockets!?) Our nursery is done, for the most part – namely because I didn’t want to deal with set up and building things if I were placed on bed rest later. I haven’t really gotten a ton of “snide comments” or “helpful advice” from strangers. I still visit Starbucks for a latte almost daily. (Half-caff of course.) No bizarre cravings – except I do enjoy the occasional doughnut and weekly trip to In n’ Out. Here is a sneak peak at her nursery, which I spent too much time making matchy-matchy. I don’t care – it’s adorable! Jen, that nursery is awesome! Thanks for the recap. Can’t believe you did the foxtrot routine at 26 weeks. Good luck with the next 90(plus?) days! Hi Stephen! Yeah – I can’t either. But I somehow made it happen. Body language is a powerful thing. 🙂 But yeah, it happens occasionally. You nursery is adorable! Good luck! 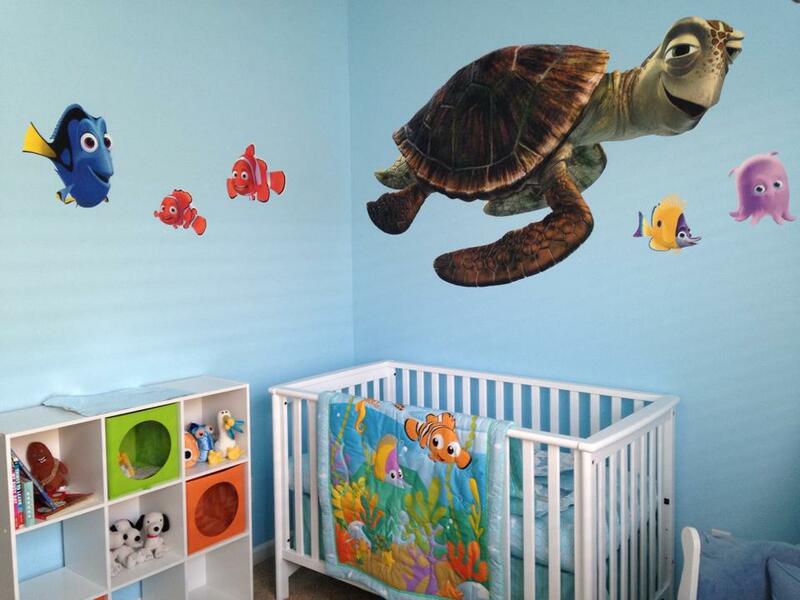 Cute nursery!! I also spent a lot of times on a D-mommy forum when pregnant. Without that daily support of other who were there or who had been there, I’m not sure how I would have made it through the 9 months (twice). That’s great that your doctor will let you go full term if all is well – mine did too and my first baby was born at 41w1d. Happy 3rd trimester! Can’t you adjust the max bolus? Or is that 25 units at one time?? And what a cute nursery!! That “just keep swimming” mantra may prove helpful during the stressful parenting moments – or so I’m told.